Over the past 20 years, millions of SELECT Products Limited architectural-grade aluminum Geared Continuous Hinges have been used in schools, hospitals, hotels, offices, airports, stadiums, storefronts and commercial and industrial buildings in new construction and retrofit applications. 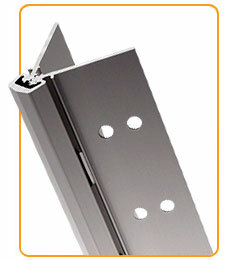 SELECT Continuous Hinges offer a Limited Lifetime Warranty (see their website for details) on their Continuous Hinges. They have independently tested these hinges to over 25 million cycles without failure! Their Pin & Barrel Hinges are guaranteed for a period of 10 years (see their website for details)!